Since 1914, wannabe record breakers have found themselves drawn to what has become the spiritual home of speed. The Bonneville Speedway in the ‘Badlands’ of Utah state. This flat 20 mile long expanse of desert salt flats has provided the backdrop for countless record breaking feats. Come September, one band of brothers in particular gather in a bid to become the fastest humans on two wheels. This year our man on point was Gabriel Uttley. Gabe if you recall is also a man on a mission. 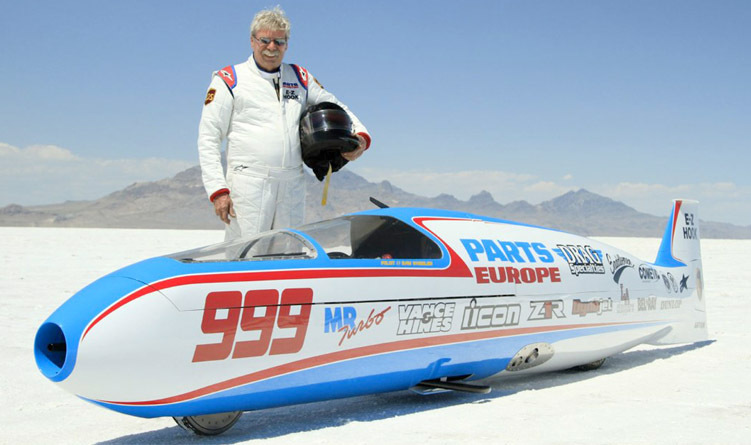 His goal to bring the World Land Speed record (LSR) for motorcycles back to Britain. A record that stands at nigh on 400mph. His Angelic Bulldog project, an obsession that has lasted almost twenty years, is now close to fruition, so much so that he had to go west and check out firsthand whether one of his fellow competitors, a certain Mr Guy Martin, might be first to break the 400mph barrier. However even in the ‘desert’, the weather can play havoc with the best laid plans, we’ll let Gabe will put you in the picture. “For the last two years mother nature had decided that the salt would not be in a condition to race on, but 2016 was looking far more favourable. During the winter months rain is needed to flow across the salt, pushed here and there by the winds. This helps to soften and level the salt crystals. Then in late spring teams from the various event organisers come to the salt and start the long preparation of the different courses. This involves skimming, dragging and rolling to leave a smooth, flat and hard course which in the case of the international course can be twelve miles long and over 100 feet wide. The Sam Wheeler Gabe refers to was a true veteran of the salt with a record breaking career that reached back to 1963. 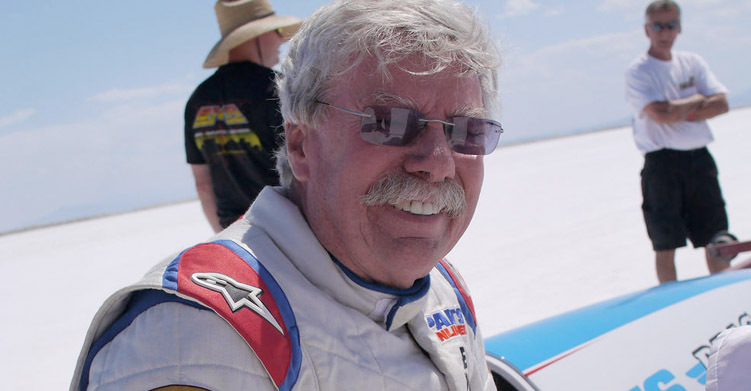 This year, at the tender age of 72, he returned to Bonneville as a front runner to break the 400mph barrier. But an accident during a shakedown run proved fatal for the LSR legend. A grim reminder if it were needed that this is not a pursuit for the faint hearted. Gabe continues. So it seemed the stage was well and truly set for a three way Land Speed Record shootout. But then it was announced that BUB7 driver Valerie had a prior engagement, and would not be there! You would think that a date with a Land Speed Record would be top trumps in most peoples book, but now it left Top 1 Oil Ack Attack and the new kids on the block, Triumph, to battle it out for the record. 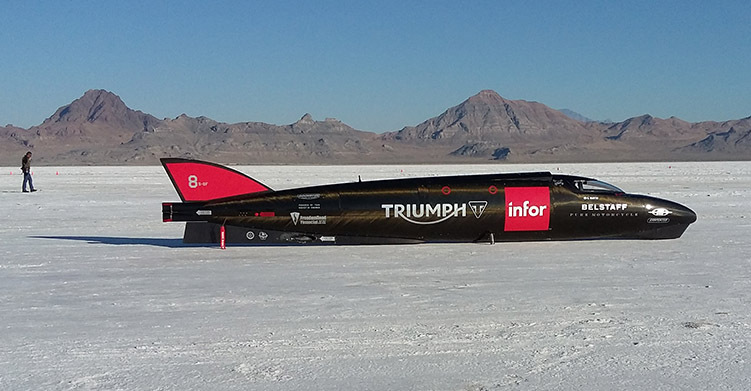 With a big name at the wheel, the Triumph team were very confident in their machine and driver, stating in their press releases that they were going to Bonneville to break 400mph and return with the record. Mike Akatiff and his Ack Attack boys simply remained quiet, knowing that they had improved their Suzuki-powered streamliner significantly since setting the record, though Rocky had not driven it since 2014. Mike however was confident that they could exceed 400mph, but knew that the salt would have to be hard and smooth for twelve miles for them to do it. Back to Gabe to pick up the story. “September dawned all too quickly. 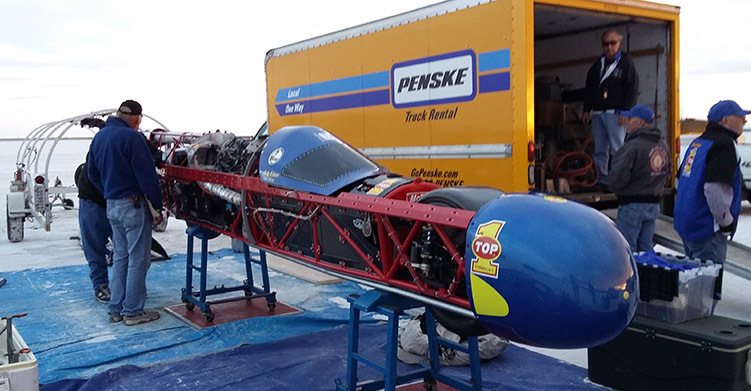 I headed out to Bonneville to see the teams setting up their pits near the highway. Word was the salt was only good for eleven miles or so and looked to be soft, particularly at either end, albeit the middle section, where the fastest speeds are reached, looked good. Mind you it tends to be that way because it is the highest section of the salt flats. After the competitor/team safety briefing, everybody had a drive down the whole course to evaluate the state of play. It would be a gentleman’s agreement as to who would run when, with teams putting in applications for the next day to the organisers to achieve a running order. With a meeting like the Shootout, it is crucial to allow competitors that qualify for a record time for a return run, so people have to announce their intentions so that the Cook crew can shut down the salt as required. The meeting is FIA, FIM and AMA sanctioned, so those officials also need to be regularly updated on what is being planned to allow them to be present at turnarounds. At this meeting the vehicles tend to complete their first run from the bottom end of the course, known as floating mountain. This allows them to stop at their pit to work on the vehicle as they make the turnaround for the second run. The FIA requires the cars do this in an hour but the FIM gives the motorcycles two hours…..
“Walking round the pits demonstrates the usual pattern of behaviour at Bonneville, with teams frantically working on their machines to prepare them for the rigours of running at huge speeds down the salt. As the saying goes; 90% of the work is done in the last 10% of the time available! 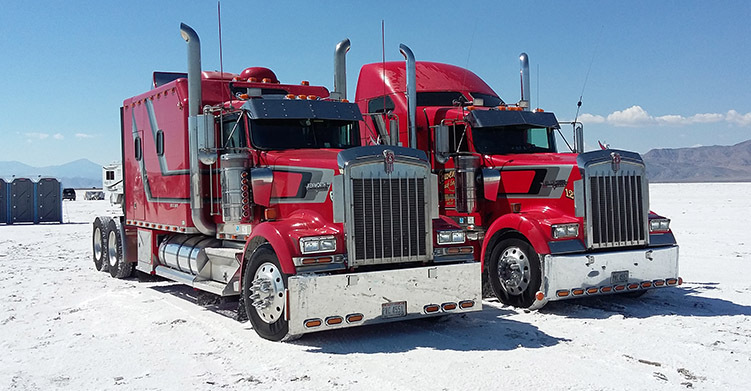 “Unlike most other sports, however, Bonneville is very open and accessible. Most teams welcome people and want them to get involved. They are generally more than willing to explain what they are doing, or have done to their machines. “I encountered one example of this “spirit” in 2009. Ack held the record, so were there waiting to see if anyone else broke it. Denis Manning and his team were thrashing away on BUB7 trying to sort out a misfire and after several hours it was all getting a bit heated, with people blaming each other but nothing was being sorted. Mike Akatiff went over to his streamliner, took the Motec ignition off and gave it to Denis so that he could try it on BUB7 and thus check whether the problem was ignition or fuel. How many world record holders would be so ready to help out their main competitor so readily in any other sport? To cap it all, after that the problem was quickly located, and three weeks later BUB7 regained the record! “Rocky went to meet Guy Martin, and they exchanged thoughts on their respective machines and how it was going. They talked about the salt conditions and how they might proceed, with Rocky preferring to wait for the salt to harden up whereas Guy was interested in achieving his licensing runs. The organisers require riders and drivers to raise their speeds in stages, starting slowly and working up in 25mph increments until 200mph and then 50 mph increments thereafter. Guy had run 274mph so was looking at 300mph and then 350mph before he was allowed to attempt the record. This is eminently sensible as it allows organisers time to watch the performances of each vehicle and it forces teams to be more patient in the building up of speed. It also allows faults that occur to be studied and if necessary rectified before a major incident happens. When these motorcycle streamliners are covering two football pitches every second this can mean the difference between life and death, so everybody is wise to be cautious. “Almost everybody is extremely friendly at Bonneville, though a few people are prone to exaggeration or suffer from memory problems, especially when recalling certain statistics…thus it pays to be cautious when taking some peoples’ word as gospel….call it friendly banter if you will, but with regard to safety then nobody will try and pull the wool over your eyes. “Bonneville is affectionately known as “the great white dyno”, and regulars will tolerate the boasts and aspirations of newcomers, knowing that only time will tell whether a machine is capable or not. As far as I know only one vehicle has been built, gone out, completed two runs and set the outright record. That was Henry Segrave with the Golden Arrow, on Daytona Beach in the USA, which only completed 18 miles in total! “As I walked through the pits, I took in the atmosphere around each team. The only unusual one was the Triumph. There seemed to be an awful lot of people around, but few of them actually working on the machine. There was a feeling of arrogance and superiority, not helped by a very aggressive film crew. It just did not feel as if you could approach anybody to speak to them like I am used to doing. Maybe I got it wrong, but as the meeting went on I found more and more people who felt the same as me….Several friends (who hold numerous world records) told me later that they had tried to offer advice to the Triumph team, but were brushed off. “In 2000 when I first competed at Bonneville I told the school children who went with me to be very careful when they spoke to anybody, as it is not always obvious who you are speaking to out there. It may be a grizzly, white-haired old man, who is crippled with arthritis…but he may have just got out of his car after a 400+mph pass! In other words, Bonneville is a place where if you want to succeed, you must listen to advice. It may be the wrong advice for your vehicle, but nevertheless it is always worth listening, then going away and either proving or disproving it. “While Rocky was getting stressed by everybody telling him to make a run, Guy set the ball rolling in the Triumph. Because their lifting/towing trailer was proving to be unstable on the salt, the team decided to tow Guy down the course to the other end to make their first pass back from floating mountain to their pit. Unfortunately, first of all the tow rope broke. The tow car set off again, and Guy hit a rut in the soft salt just off the course and the streamliner went down. After a long session in the pit checking it all out, they tried again the next morning. Guy went down the course but the engines sounded awful. He kept shifting through the gears trying to get it to clear without success. He went through the timing lights at 184mph, having recorded just over 200mph on his dash. Back to the pit for more work. Meanwhile Rocky was sitting it out, but he was not enjoying the experience. I have never seen him so agitated before. Normally he is such a laid back, happy man. “The next morning Guy was back, ready to hopefully make a pass around 300mph. Danny Thompson had proved that the salt was not that bad when he achieved 413mph before a mechanical failure, and the Venturi Buckeye Bullet electric car achieved a top speed of 358mph, so maybe today was the day when the Triumph started to show its worth. Guy set off, but shortly after got in some soft salt caused by wheelspin from one of the cars and the traction control could not keep up. The streamliner fishtailed wildly before going down and sliding along the salt, turning over and making a mess of the gorgeous carbon fibre bodywork. Unfortunately, some salt got pushed into the turbochargers, ending the meeting for Guy and the team. “Rocky made a run on the Monday in Top 1 Oil Ack Attack, but it was just a pass through at 122mph and was a real disappointment. Rocky said he was very unhappy with the condition of the salt. 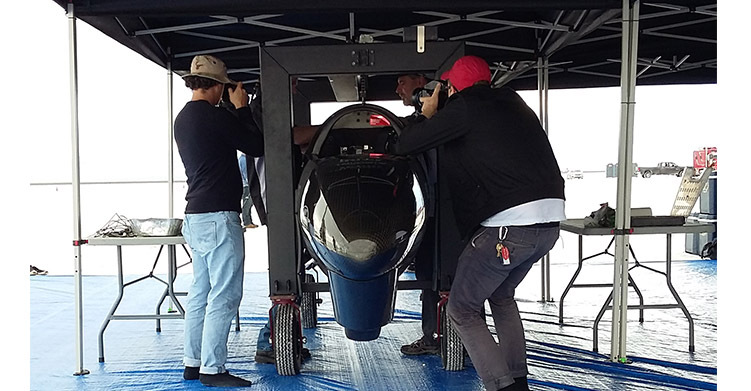 “The ultimate outcome at Bonneville can be extremely simple. A team will stand or fall by their performance. The timing slip does not lie, and sometimes a bit of humility proves valuable when things don’t go so well…. “The best teams go away after a failure, complete the post mortem and come back stronger and better prepared. Others keep trying without realising or admitting that they got it wrong in the first place and that it will never happen without a total rethink and redesign of the vehicle. After all, there is only so much theory you can apply, and a computer can only do what it is told to do. The best test is on the salt! So the 400mph barrier remains intact and Gabriel and his team are working even harder to complete their Bulldog. Will they get it ready and tested in time for next year? 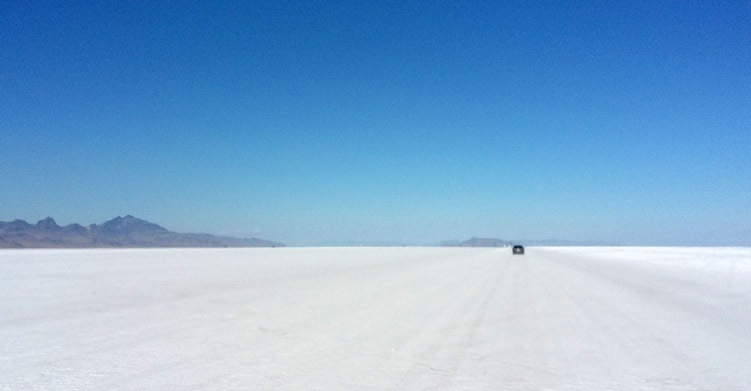 Will the weather smile on Bonneville and let the Land Speed battle commence? Will Guy and Triumph return for another crack? Time will tell and we’ll be be there to tell the tale.